You've done all the hard work. The amazing story you've been writing is 99% finished; now you just have to end it. Cue aimless staring at the computer screen, right? Ending a story can be an excruciating and frustrating experience. We all want that perfect conclusion, one that complements and fulfils the purpose of the story. We especially want an ending that leaves ourselves and our audience satisfied. Achieving this is not as easy as it sounds; an ending takes on a lot of gravity when you realise there's no coming back once it's done. Often, a reader's most long-lasting memory of your story will be its ending, so it's important to agonise over it just as much as you did your faultless first paragraph. Thankfully, there's a limit to the numbers of ways you can tie up your tale. The way your piece ends should largely be connected to how you've written the rest of the story. You should know what you were trying to say when you set out to write, and thus have an idea of the impression you want to leave when the story is over. 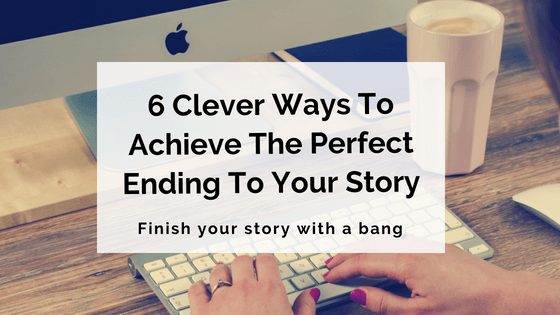 There is a theory that stories can only have five possible outcomes, but to make things even easier, here are six specific types of endings you can consider to help you finish your masterpiece. The end is in sight...or is it? Dean investigates six ways to wrap up your story. Image source: Johannes Ortner via Flickr Creative Commons. A resolved ending is great if you want everything neatly packaged and put away. All the plotlines and character threads are concluded. There's no conjecture and no questions to be asked. The fate of everyone in the story is known and it is clear how the characters might live on into the future. This is good if you are writing a singular novel or concluding a series. Examples that immediately come to mind are mysteries. Despite the bulk of a mystery novel being clouded in suspense and confusion, everything is illuminated for the reader at the climactic end of the story. Usually, one or more people unravel the mystery and expose the culprit or cause of distress. A style that commonly employs this ending is the 'whodunnit' story; an awesome example to check out is Stephen Donaldson's The Man Who Tried To Get Away. Fairy-tales also use resolved endings, almost every time. Don't be tricked into thinking this type of ending has to be all roses, though. A story can be resolved without being happily resolved. Take a look at these original fairy-tales that aren't so Hollywood-perfect. This is basically the opposite to a resolved ending. The overarching plot is left unfinished and the ultimate outcome of the characters' story arcs is unknown based on the textual information. This might be used to entice readers to use their imagination and create their own ending, satisfying themselves. More commonly, it's used to set up for a sequel. References are usually made to tasks still to be done or conflicts still to be determined, essentially making the book one big chapter of a larger story. Obviously, this is one of the easiest endings to write. Readers understand nothing has to be wrapped up here, but it's still vital to create a sense of excitement and anticipation using an unresolved ending, otherwise people may not be interested in coming back for the second instalment. There are plenty of famous examples to pay heed to, such as Tolkien's Lord of the Rings trilogy, Rowling's Harry Potter series, or The Chronicles of Narnia books written by C. S. Lewis. This is often the most tempting ending for an author and the most frustrating for a reader. This ending is very effective because it creates a talking point and keeps the reader pondering long after they've put down the book. For an author, this is ideal; if readers are thinking about you, they'll likely go looking for more of your work. A terrific example of this type of ending is Shutter Island by Dennis Lehane (also made into a film starring Leonardo DiCaprio). In this story, there are two explanations for the reader to consider at the end. One is more implied than the other, but both are feasible. Lehane has written so masterfully that he effectively teases the reader, leaving them uncomfortably torn between the two. Personally, it took me a couple of months and a conversation with my mother, who had also read the book, to settle on one ending over the other. In theory, a story that ends in this way catches the audience by surprise with a completely unexpected turn of events. As a result, the whole story is usually turned upside down, with a previously believed fact turning out to be false. This may involve a character 'coming back' from the dead, a hero revealing themselves as a villain (or vice versa), or a new and vital piece of information coming to light at the last minute. Fight Club by Chuck Palahniuk is a novel (and film) that quickly comes to mind here. The revelation towards the end of the story will have you replaying every previous event in your mind and will completely change your understanding of the novel. Here's a list, topped by Fight Club, which includes six more of the best plot twists seen in literature. To put it simply, a story written in this fashion will begin and end in the same way. The ending is revealed first before the author fills in the details of how that ending came to be. While this may take away some of the suspense for a reader, a clever author is still able to introduce twists and surprises. A tie-back ending also allows for a very focused method of writing – it's always easier to navigate if you know where you're going, right? It also creates a feeling of balance and equilibrium for the story. American author Kurt Vonnegut had many tips for writers, including that they should 'start as close to the end as possible'. The Star by Arthur C. Clarke is a nice short example of a tie-back ending; the beginning shows a main character in pain, and the ending ties back to the cause of his pain. Read it online here. This conclusion goes 'beyond the ending' in a way, looking into the future. It explains what happens to the characters years after the main events of the story. Authors and readers alike may think they want this ending – understandably, they want to see more of their favourite characters – but most of the time, it may not really be necessary. A common way of writing a 'crystal ball' ending is with an epilogue. An example might be a section in which the perspective is from the main character's child, who was absent from the main story. Harry Potter and the Deathly Hallows fits nicely into this category, rounding off the series with an epilogue set 19 years after the main story. What sort of ending will you envision for your characters? Image source: Kev Lewis via Flickr Creative Commons. Six endings to consider when finishing your story, novel, or script. Always remember what you set out to achieve and consider the feelings you want to leave with your audience. Last impressions are just as important as first impressions. Want more tips and tricks? Click here to learn how to hook your readers. Thanks Dean! It’s good to have things to keep focused and clear while working on an ending; even with all that work already done it’s not quite time to relax! Hi Kyla. Yes it’s the most frustrating part of a story for me personally. You wouldn’t believe how many poems and shorts stories I have that are three-quarters finished!